LIC Jeevan Labh Plan is a new insurance policy from LIC which is a mixture of Investment and Insurance. The payment of premiums for this LIC’s Jeevan Labh Plan is limited to a term shorter than the policy. Hence it is termed as Limited Premium Endowment Plan. So, Let’s have a look at the following sections of this page to know more about LIC Policy Jeevan Labh. The LIC Jeevan Labh Plan 836 is a new Endowment Plan introduced by Life Insurance Corporation of India on 1st January 2016. This Jeevan Labh LIC Plan will start working from 4th January 2016. A Unique Identification Number is given for LIC’s Jeevan Labh Plan that is 512N304V01. The policyholder has to quote the UIN no. in all relevant documents that are required to buy the policy. Jeevan Labh LIC Policy is a Limited Premium Paying, Non-Linked, with Profit Endowment Assurance plan. The benefits payable to the Insured are sum assured plus vested Simple Reversionary Bonuses and Final Additional bonus. LIC’s New Endowment plan 836 is a non-linked participating Insurance Plan. The LIC New Jeevan Labh Plan provides Optional Benefit, Accidental Death and Disability Benefit Rider by payment of additional premium. LIC Jeevan Labh Plan 836 also takes care of Liquidity needs through its loan facility. This plan offers a combination of protection and saving features. 59 years (nearest birthday) for Policy Term 16 years. 54 years (NBD) for Policy Term 21 years. 50 years (NBD) for Policy Term 25 years. Yearly, Half-yearly, Quarterly or Monthly mode (through ECS only or through salary deductions). Sum Assured shall be in multiples of Rs. 10,000/-. Death benefit (Benefits payable on death) = ‘Sum Assured on Death’ + vested Simple Reversionary Bonuses + Final Additional Bonus if any. The premiums mentioned above exclude taxes, extra charges, and Rider Premiums if any. Quarterly and monthly mode NIL. Rs. 5,00,000/- to Rs. 9,90,000/- 1.25 % Basic Sum Assured. Rs. 10,00,000/- to Rs. 14,90,000/- 1.50 % Basic Sum Assured. Rs. 15,00,000/- and above 1.75 % Basic Sum Assured. Application form/ Proposal form No. 300, 340 and 360 along with a photo. The documents required for claim procedure under LIC Jeevan Labh 836 Policy are given below. Here we are providing the required data for calculating the premium rates in LIC Jeevan Labh Policy using LIC Jeevan Labh 836 premium and maturity calculator. To calculate Premium Online, the Insured have to enter the following details mentioned below. 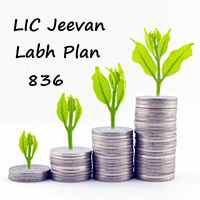 After entering all the above details, you can easily calculate the premium for LIC Jeevan Labh Plan 836. LIC Jeevan Labh 836 Plan Maturity Calculator helps you to calculate the maturity value or maturity amount. Maturity amount is the amount that is payable to the policyholder during the maturity time. You can calculate the Maturity benefits using Jeevan Labh LIC Plan Maturity calculator. Maturity amount is calculated based on previous year Bonus Rates. LIC Jeevan Labh Maturity Calculator provides maturity amount based on Policy term, Age of the LIC Policyholder, Sum Assured, Policy name, etc. You need to provide these details along with the Mobile number, Name, Email ID to calculate the maturity value. But you will receive approximate or nearby maturity amount in this LIC Jeevan Labh Calculator. Under LIC Jeevan Labh plan 836, the grace period of one month but not less than 30 days will be allowed for payment of yearly or half-yearly or quarterly premiums and 15 days for a monthly mode. New LIC Jeevan Labh policy intended to participate in profits of the Corporation and entitled to receive Simple Reversionary Bonuses. Paid-up value = 2,00,000 x (5/20) = 50,000. The policyholder can surrender the LIC Jeevan Labh 836 policy at any time during the policy term, provide at least three full years premiums have paid. If premiums are not paid within the grace period, then the policy will lapse. A lapsed policy may be revived during the lifetime of the life assured, but within a period of 2 consecutive years from the date of first unpaid premium and before the maturity date. If the life assured commits suicide before 12 months from the date of commencement of risk, the corporation will return 80% of premiums paid to the insured excluding any taxes and extra premium, if any. Riders are available under this LIC Jeevan Labh Plan. Availability of Accidental Death and Disability Benefit Rider and New Term Assurance Rider. LIC’s Accidental Death and Disability Benefit Rider UIN (512B209V01): LIC Accidental Death and Disability Benefit Rider (AD&DB) is accessible as an optional rider. LIC’s New Term Assurance Rider UIN (512B210V01): LIC New Term Assurance Rider is available at the policy on payment of additional premium. Along with this, you can also find other LIC Insurance Plans from our site such as LIC Term Plans, Money Back Plans, Pension Plans, etc. kindly let me know whether i am eligible? Sir, kindly let me know how much premium payable for taking JEEVAN LABH POLICY . My date of birth is 11th February 1966 and required sum assured is Rs.10 Lakhs . Coverage till my age of 75 years required by me. My age is 37, I am planning to take jeevan Labh plan 836 for 8,50,000/- yearly I have to pay nearly 74,000/- upto to 10 years, and the policy will get maturity after 16 year. please suggest me it is good or not for me. My annual income is 4.2 lakh. Very good LIC Jeevan Labh 836 policy. I want to take this policy for my mother. Her age is 52. I want sum assured 2,00,000. What would be the premium? My age is 46 years & i want to take JEEVAN LABH policy for Rs2500000/ for 21 years. I wanted to know what is the premium P A. & what is the reabet i will get on High Basic Sum Assured for making Premium amount. I am 50 years of housewife. Interested in jeevan lubh policy.plan to pay a premium of one lakh per annum for 10 years and after 10 years deposit the amount into jeevan aksay pension plan. Sir, I have opened a LIC Jeevan Labh Plan with sum assured of Rs.300000 for 25/16 years at the age of 45. please confirm what is the maturity amount. YOU CAN CONTACT ME FOR NEW BUSINESS OR ANY SERVICING NEEDED IN LIC. I AM IN KOLKATA AND MY MOBILE NO IS 9874363662 .